Reducing the waste from food in a domestic household is a major contribution to recycling and reducing waste in general. Some 40% of a household weekly waste output is food in some form or another, be it food that has been bought and for whatever reason not eaten, or food that has been cooked and is left over, or byproducts from the cooking process, i.e. peelings or teabags. This 40% that is going to landfill with the rest of the household waste is in itself waste: it could be prevented, or composted. With a looming crisis over how little time left all the landfill sites in the UK have left, and limited space in which to build new landfill sites, it is imperative upon all the householders in the UK to engage in recycling initiatives and find ways to reduce their daily and weekly household food waste. The first, and perhaps most obvious way to reduce food waste (although it is often overlooked), is to plan carefully each week what is needed, and buy only within these limits. Making a list of which items are essential, like bread and milk, and plan carefully for what type of meat, fish and vegetables are needed. Many people carefully plan a weeks meals in advance. This can reduce waste and importantly saves expense. Given that the UK is now in an economic downturn, many households across the country are feeling the pinch, so this is a good time to find how to make savings and produce less waste. The reduction of bringing too much food, be it fresh or pre-cooked or pre-packaged, can also help in reducing the amount of plastic, in the form of plastic food trays, wrappings or containers, and the ubiquitous plastic bags, that is regularly brought into the house.Make a list of the essentials, think carefully which luxuries and peripheral foods and drinks are needed, and plan if there is a special event or big family meal which needs more food and more preparation. Only buy food when it is needed - don't allow fresh food to sit and rot in the fridge or on a counter. This is the height of waste. Meat and fish that is left to go off and then be thrown away is simply disrespectful to the animal that gave its life to produce food. Eating left over food is far from a new idea, but recently many people are rediscovering the delights of eating what they discover in their fridge the next day, and stretching food across a few meals. For instance a chicken carcass, left over from a roast chicken dinner, can be used to make a delicious chicken and vegetable soup - perfect for the winter evenings, or a casserole. Leftovers are great for breakfast - salmon trimmings mixed in to a scrambled egg for breakfast or a brunch, with some toasted left over bread is one great way of making the leftovers go further. Left overs can make a great lunch as well: invest in a flask, and take last nights soup or stew (or even risotto) into work and impress your colleagues with your culinary resourcefulness. Left overs last longer when used wisely. Try combining with new fresh ingredients and herbs and spices to create new recipes and meals with a fresh new twist. Its all about reduction of waste, careful planning and resourcefulness. Get the whole family involved, and cut down the daily food waste of the whole household. Composting can become a fabulous addiction: if you are a gardener, or know one, then you will take real delight in seeing the old teabags and carrot peelings from your kitchen become a great fertiliser for the potted plants on your windowsill, or for the vegetable patch in your garden or allotment. Take time to research what can and cannot be composted, and see how quickly it is possible to reduce the food waste that leaves the kitchen. It is easily possibly for every household in the country to reduce that 40% food wastage in their household bin to zero by following all the simple steps above and by composting. 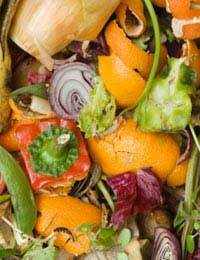 There are many composting options available. Most local Councils now provide green wheely bins where all food waste - both raw and cooked - can be separated. This then goes to a special composting facility in the local area that turns it into compost very quickly, then sells it very cheaply back to the local community for gardening use.